Everything you need to know about the Kentucky Wildcats as they begin the NCAA tournament. 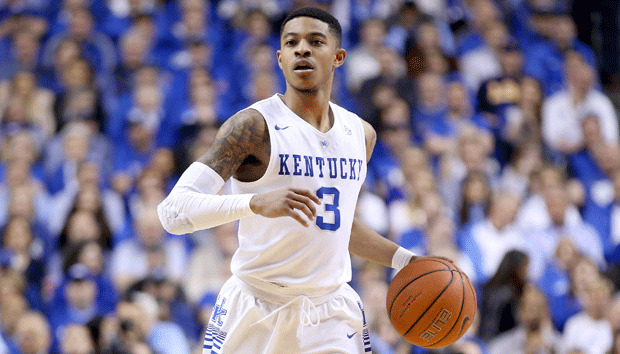 The Case For: Kentucky is led by arguably the best backcourt in the country. Sophomore Tyler Ulis is a skilled facilitator who cut down on his turnovers this season and assisted on 40.5% of the Wildcats’ buckets during SEC play, the highest mark in the conference. Yet the first-team SI All-America may not even be as talented as Jamal Murray, a freshman guard who drained 44.4% of his threes during conference play, according to Kenpom.com. Ulis’s passing and Murray’s shooting are two of the main drivers behind Kentucky’s nation-leading adjusted offensive efficiency mark, but don’t dismiss the Wildcats’ frontcourt. Junior Derek Willis can stretch the floor by knocking down jump shots—he sank half of his treys against SEC competition this season—and senior Alex Poythress is a strong rebounder who excels finishing at the rim. Then there’s Skal Labissiere, the top recruit in the class of 2015, according to scout.com, who looked lost for much of the season while sliding down mock drafts but seems to have found his bearings just in time for Kentucky to make a deep run. The Wildcats have loads of talent, tourney experience and a coach with six Final Four appearances (two vacated) to his credit. The Case Against: Last season, when Kentucky opened 38–0 and reached the Final Four, it was powered by one of the best defenses in recent memory. This season the Wildcats have fallen all the way to 72nd in adjusted defensive efficiency. Though they are proficient at forcing misses inside the arc and preventing opponents from shooting threes, the Wildcats don’t force a lot of turnovers, they allow opponents to grab missed shots at an alarmingly high rate and they send opponents to the free throw line too often. While it’s not surprising that Kentucky’s defense would suffer after big men Karl-Anthony Towns and Willie Cauley-Stein left for the NBA, slippage of this magnitude should concern Wildcats fans expecting another national semifinal appearance. Moreover, though coach John Calipari has been able to reload the Wildcats with elite talent year after year, there’s a big gap between last season’s team and this one. Kentucky should be able to win a game or two because of its elite backcourt and offensive firepower, but its issues on the other end of the floor coupled with the uncertainty surrounding how Labissiere will perform imposes a lower ceiling on these Wildcats. Kentucky is good—it’s just not great.